This anatomy saga is in continuance with my ongoing pursuit of thorough knowledge of the equine hoof and relevant structures. The frog and digital cushion are often argued to be the most essential part of the horse hoof, yet there are many unknowns. The functions of the frog and digital cushion complement one another so favorably that they should be presented in a single blog that highlights their purposes both independently and together. The frog horn that is visible to the eye is made up of squamous epithelial tissue that has grown distally from the frog corium. The frog corium is made up of soft tissue that originates below the digital cushion. The diagram below displays the digital cushion superiorly, the corium, and the keratinized frog horn inferiorly. With every footfall, the frog and digital cushion work together. At ground impact, the frog accepts shock and expands to dissipate jolting on the lower limb. Simultaneously, the proprioceptors of the heel region judge terrain and ground condition and react accordingly within milliseconds. As pressure is applied to the frog, the digital cushion is compressed under the short pastern, navicular, and coffin bone. 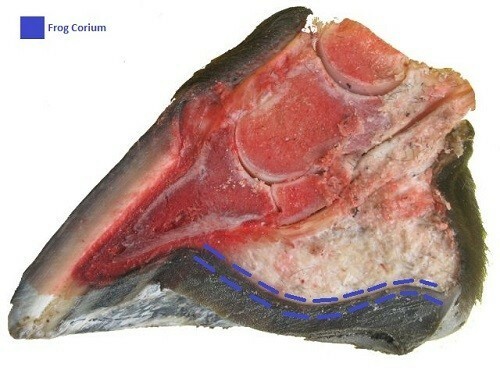 The vascular cartilage of the cushion is compacted, forcing blood flow proximally back up the limb of the horse. 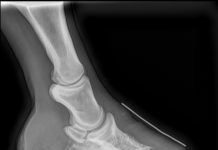 When the hoof returns to stride, the cartilage is re-supplied by blood flow – the heart of the hoof? 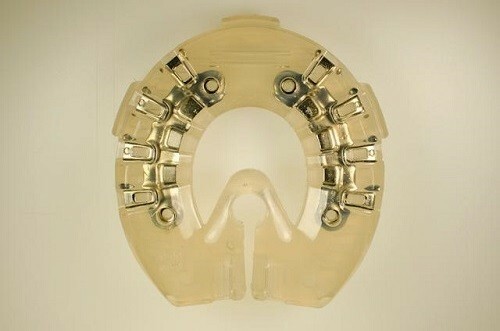 The digital cushion has a responsibility of providing angle to the coffin bone. A healthy, firm cushion provides a pedal angle range of 1 to 6 degrees (may vary depending on veterinarian or hoof care practitioner preference). A digital cushion that is neglected or has not been allowed to develop properly is fatty and soft. 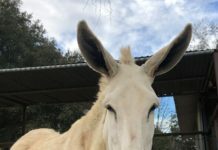 Often times, with an underdeveloped cushion (and other hoof shortfalls), the pedal bone will respond by “falling” in the hoof capsule; losing its positive angle and accepting a negative angle. Several causes exist for debilitation of a digital cushion including poor diet and lack of exercise. Loading the hoof wall, such as applying standard metal shoes, hinders the ability of the frog to make contact with ground surface. It can be challenging to maintain a robust frog and digital cushion when inadequate interaction between terrain and heel occurs. However, removing shoes from a horse that has been shod for years and has possibly acquired meager frogs and cushions can be a daunting undertaking. Is there a solution? I think so. The EasyShoe Performance N/G (Provides frog support and allows frog-terrain interaction). Previous articleEasyShoe Spacers – Why, How and When?